It's been a weird old year, 2016! We've suffered massive political blows, and there have been some horrific things happening around the world. It's safe to say that I think many people have high hopes for the next year or so. I'm certainly hoping for peace and compassion, especially for those having a tougher year than I could even imagine. Despite the struggles of 2016 worldwide, personally I had a pretty good year. At the beginning of the year, I was promoted which has brought it's ups and downs, mainly showing me how much I value working hard. I've travelled to six different places, and loved every single one of them! 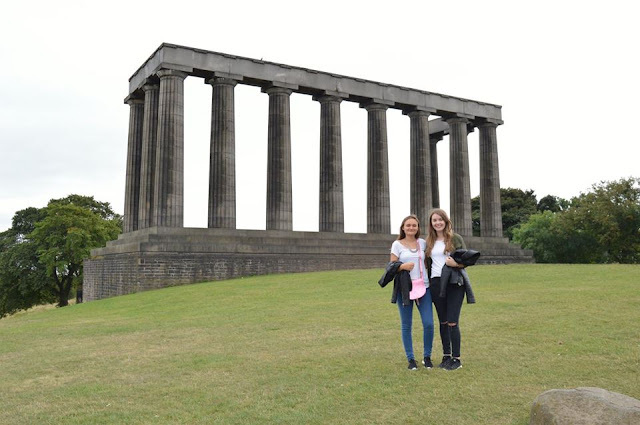 Dan and I have made some important decisions about our future, and I've had some of the best times with friends and family - V festival, Edinburgh with Georgia and celebrating my Grandpa's 80th birthday. I've seen films that have made me laugh, and read books that have made me cry. 2016 has reminded me of how important it is to spend quality time with friends and family; whether that's exploring a new place together, or just meeting up one day for breakfast. Helping others, and being close to those around you is so important. 2016 has been a year of realising my resilience, and also acknowledging that being an adult is tough at times. When I finished uni, I had a vague 5 year plan that I felt absolutely certain I would be sticking with. According to that 5 year plan, we'd be moving into our own home in the first quarter of 2017; which we technically will. However we'll be renting instead of buying! House prices are incredibly high in this are so we're going to wait it out and save some more whilst still taking that next leap. 2016 has been an excellent year for travel for me. As this was my first year working full-time, we knew it would be pretty travel heavy as there are so many places we wanted to see, and this seemed like an excellent time to start. In April, we chose to go to Amsterdam. A gorgeous city, only an hours flight away from the UK. 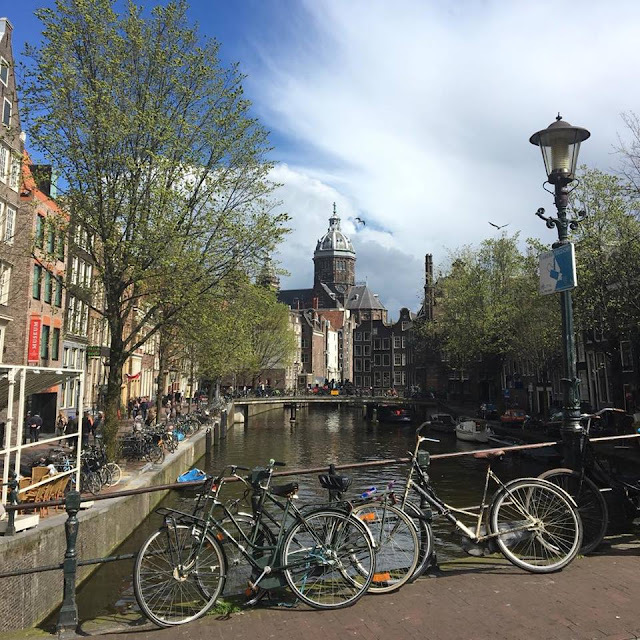 We both absolutely loved it, and wished we could have had a bit more time to explore the city and Holland in general actually! We stayed just by the Rijksmuseum and had a fantastic three days seeing what Amsterdam had to offer us. Highlights included the Heineken tour, cycling around Vondel Park and eating hot chips whilst walking the main street from the station. Definitely a city to visit if you only have a few days! 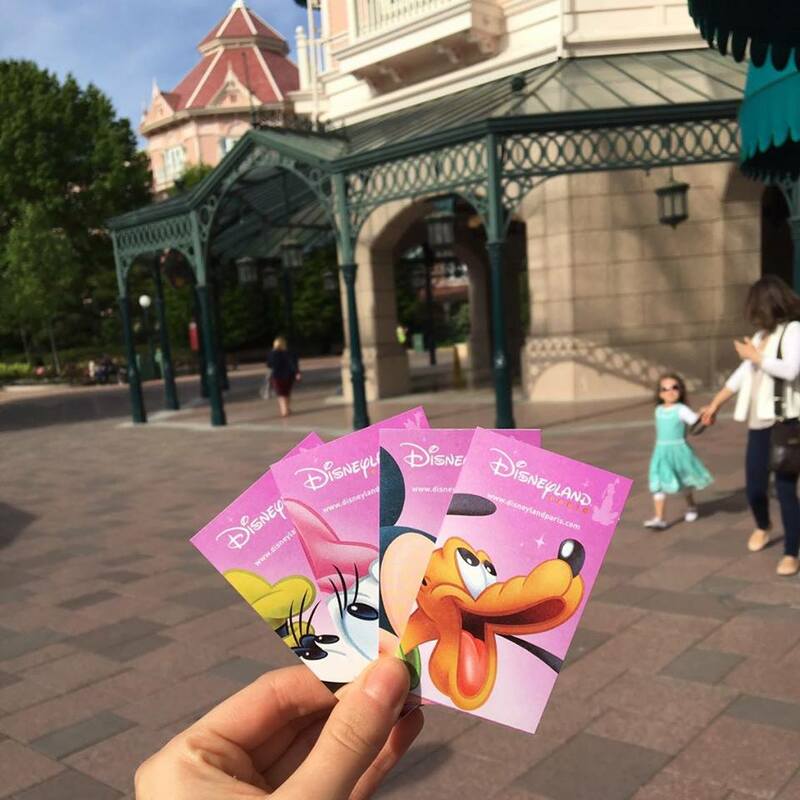 In May we headed to Paris; mainly for a visit to Disneyland with my sister and her boyfriend. We took the Eurostar for the first time (which I loved) and stayed in a questionable hotel that cost us all £37 for two nights. We spent one full day in the Disney parks, and had the best time ever. None of us wanted to leave, but thankfully we had a morning to explore Paris the next day! I definitely want to go back and see what else Paris has to offer as it was such a fleeting visit. June took us to Lindos in Rhodes, Greece. We had the best week away relaxing and enjoying the Greek food and sunshine. 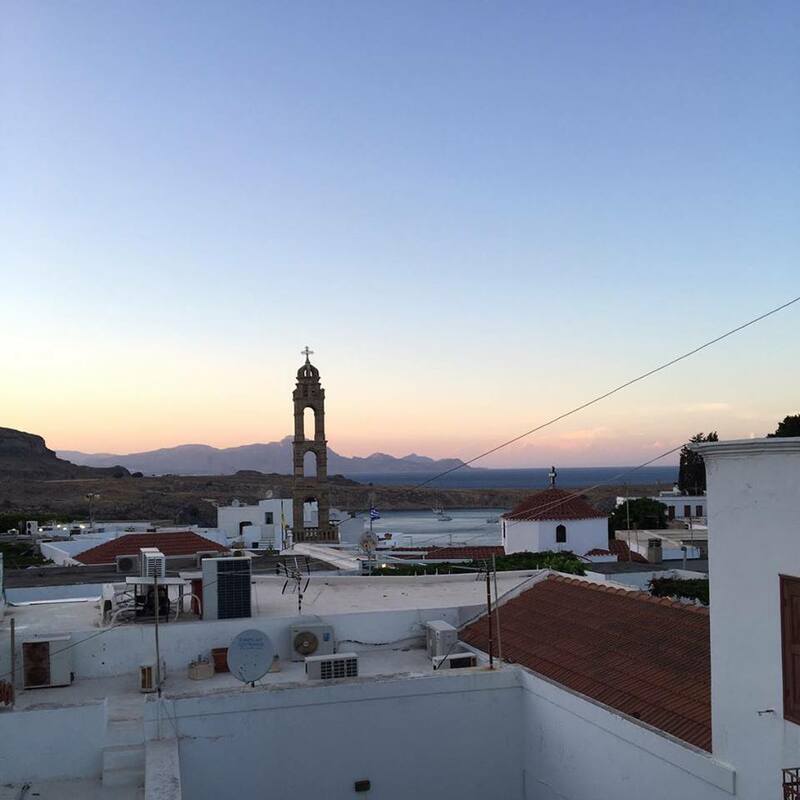 The village of Lindos itself was truly stunning, and the best place for us to be able to recharge our batteries and enjoy each others company. Days were mainly spent chilling by the pool playing uno and reading books, whilst the evenings were spent ambling the streets of stunning Lindos, with its white wash buildings and roof top restaurants. September was my next trip, and this time I was off to Edinburgh with Georgia from Mapped Out Blog. We had such a fun weekend exploring Edinburgh which I can only describe as a magical city. It drew us in from the start, and we loved exploring it. Plus, as it was relatively small, it meant we could see most of the things we wanted to in the weekend we were there. Definitely one to visit if you want a weekend away! October was our biggest trip of the year; we were heading to New York. It's been somewhere we've both wanted to see for a very long time and decided that we should just go for it and treat ourselves. 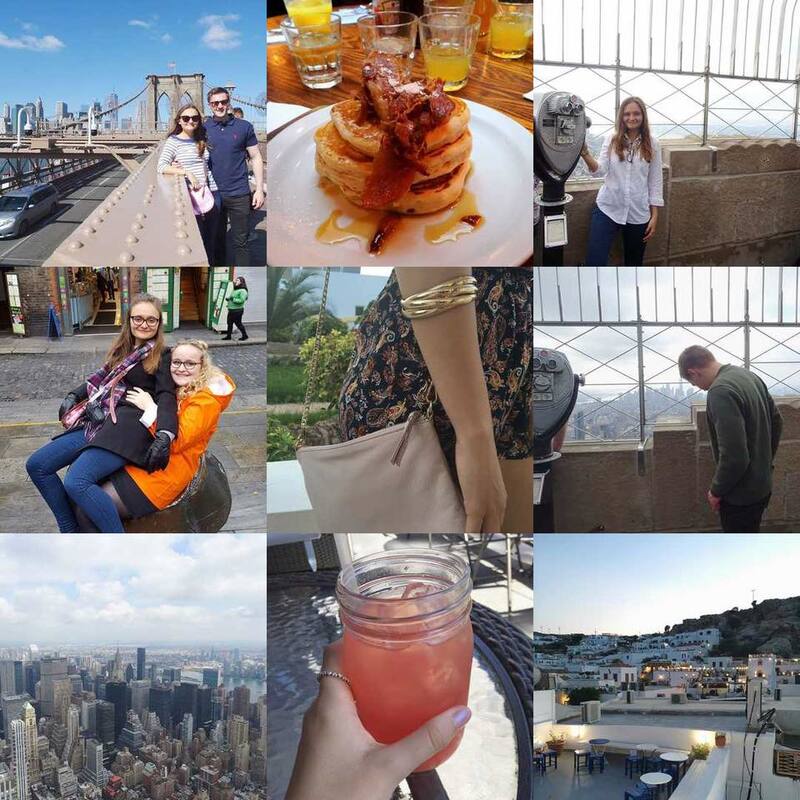 We had the best week, and loved exploring the city that never sleeps. Waking up every morning to the city views was incredible, and we slept with the blinds open on more than one occasion! Next time we'll go at Christmas because I can't even imagine how special it would be then. Our final the trip of the year was Dublin in November; a surprise for my Dad's 50th. We had a blast, and loved walking the streets of Dublin with the family. It was such a great weekend, and I'll definitely be heading back there to explore some more. We stayed in a lovely hotel right near the centre, had some incredible food and saw all of the sights! I've had the best year exploring some of the most amazing places, it makes me excited to spend time in different cities and countries and enjoying the culture, language and food whilst I'm there too. Here's to the places I'm hopefully going to explore in 2017! I have spoken for my love for Marco Polo Travel Guides on Suitcase and Sandals previously here and here so I was so grateful when I kindly recieved one of their Spiral Guides for my latest adventure to New York City. One of my favourite things to do in the mornings whilst we were there was to sit by our window and read all about the exciting things we were going to be getting up to that day! The guide is excellent because it goes into so much detail about the tourist attractions and things that can be seen in the city they are written about. I learnt so much about places we were going to see; such as the Statue of Liberty and Grand Central station. Dan was impressed when I told him some of the things I'd learnt whilst reading up on them; such as the fact that the Statue of Liberty has 7 points on her crown to represent the seven continents/seas of the world. You definitely wouldn't have got such interesting information on the internet, and part of the reason I travel is to learn something new, so I love reading up on the city I'm going to before I go! One of the main things I love about these guides is the way they are laid out. Starting with the magazine section at the front for more general information about the city, finishing with "do's and don'ts" tips on the final page. The magazine is great because its gives you a little bit more information about the city itself, including interesting facts about films that have been set in the city and the best Fashion you can find in The Big Apple! 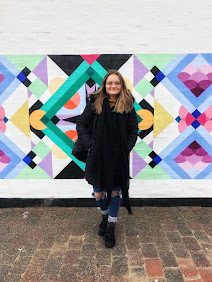 As we're trying to save for our first house, we really appreciated the Budget Bests - a selection of things to do so you can "see the city on a shoestring"! Finding Your Feet is another great section; as I can be quite an anxious traveller, I love knowing where I will be going as soon as I land, and I found this section really helpful in planning our onward journey from the airport. The rest of the guide is laid out in sections according to the area of New York; for example Midtown Manhattan and Greenwich Village. As there is just so much to see in NYC, laying the guide out like this is great. If you are savvy like we were and planned to spend out days in different areas of the city, this will help you out a lot as you don't have to constantly flick between sections to find out information for what you need. For each attraction, it tells you a guideline price, location, website/contact information and the nearest station/bus stop which makes planning your trip a lot easier too. The real highlight of this Spiral Guide for us though was the map. Whilst NYC is one of the easier cities to navigate, we found the map incredibly helpful. Especially on our first night, as after having been awake for close to 24 hours, we were struggling a little to find our hotel; but thanks to our Marco Polo map we made it! I'd love to show you a decent picture of this beloved map, but unfortunately we used it so much that it actually has a small hole in it now...It was the best map we've ever used, and I would choose it over google maps anyday! Have you ever used the Marco Polo travel guides? *I kindly recieved the Marco Polo Guide for free in return for a review - I must say though, they are excellent. Bastille are a band I have always enjoyed listening to. From weeks into first year, I would listen to their first album after being introduced to them by my cousin. It reminds me of the incredible fun we had in our first year halls, so when I saw someone selling tickets on Facebook, I immediately pestered Dan to come with although it didn't take much persuading! We were joined by our friends from first year, Dan's flatmates Andy and Theo. Our tickets were only £32 and it was so nice to be out and doing something different on a Tuesday night - definitely going for my new resolution to do more over here! As it was at the O2 we headed up after grabbing dinner on the way, and met the boys for a drink beforehand. I love going to gigs, and was so excited to see Bastille! Whilst our seats were pretty high up, we got an incredible view of the stage! I quite like being up high because you get to see everything happening and I think it really adds to the whole atmosphere of an event. We were able to see everything - from Dan coming into the middle of the stage, to the smoke and glitter bombs that went off during "Rhythm of the Night" - incredible! As they have recently brought out a new album - Wild World - most of their songs were much newer! We knew quite a few of them, but it was their "old" music that really got us dancing - probably the nostalgia talking! Icarus, Pompeii, Things We Lost in The Fire and Weight of Living are all songs that take me back to my first year of uni, and also the first year of being with Dan so it was great to be there with the boys. Bastille were one of the bands you go to see, and you realise that they sound exactly like their recorded tracks. Their voices were incredible, and the musicians were so talented. I love that they have such a unique sound, you can instantly tell it is a Bastille song when one comes on because it is so different to anything else in the charts. I'd definitely see Bastille again, and couldn't recommend them more as a band to see live! I had the best evening dancing to some music I love, with some fantastic people. It really was an excellent change to my usual midweek events, and I'll definitely be doing it again - or so I hope. 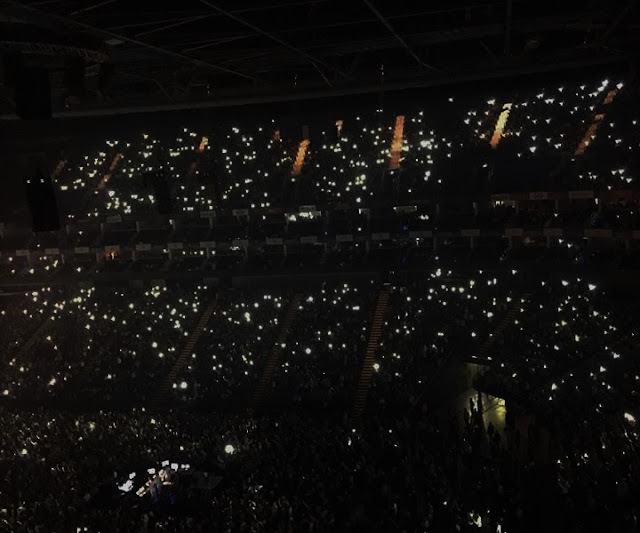 Have you seen Bastille live? Whilst we didn't have to wait long, be prepare to queue as it is a very popular destination for locals and tourists alike. Unfortunately it was raining, but it didn't dampen our spirits as we knew what awaited us inside would be worth the wait! We eventually got in, and were lead to our table. The decoration inside is minimal but homely; it isn't one of those places where you almost feel afraid to move because everything is so white and clinical. Georgia and I opted for the ice tea which was delicious! It had a fresh taste of mint and lemon and was the perfect drink for brunch. It was so refreshing, and came in such a gorgeous bottle as well. It's all in the detailing. Drinks on the table, we all placed our food orders. Being super adventurous, we all opted for the Pancakes with Bacon and Maple Syrup. We were in for a treat when a huge stack of pancakes arrived for each of us. They were American style pancakes which worked perfectly with the salty bacon and super sweet maple syrup. At £9, they certainly weren't the cheapest breakfast I've ever had, but they were definitely one of the best! The Breakfast Club is the perfect venue if you are looking for something different in London. It's delicious, not awfully expensive and has a lovely chilled out vibe. I think part of the reason you queue is because they don't overcrowd the cafe itself - there's no rushing necessary which is ideal when you are catching up with two of your favourite girls! Have you ever been to The Breakfast Club? I fell in love with Turkey on my first visit back in 2011. It's a gorgeous sunny country with some of the friendliest people I have met. The weather is divine, the food is delicious and I love the Turkish culture. I'd recommend Turkey if you are looking for somewhere to completely switch off and soak up a different culture. 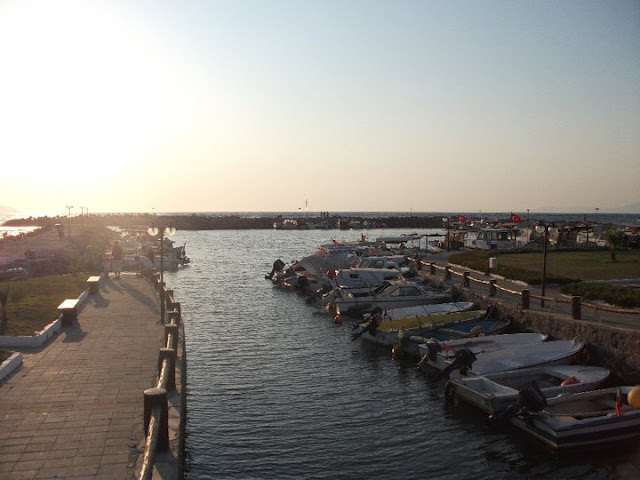 It's easy to fall in love with Turkey, especially if you go off the beaten track! You may argue that of course the people are friendly, they want your business - but they really are lovely. One of the restaurant owners (who also ran the boat trip we went on) was very helpful, and really looked out for me and my friend who were in Turkey alone for two weeks; going to the lengths of picking us up from our villa to ensure we were safe which was very nice of him! Everyone is so happy and friendly. Losing myself in a Turkish market is one of my favourite things to do. 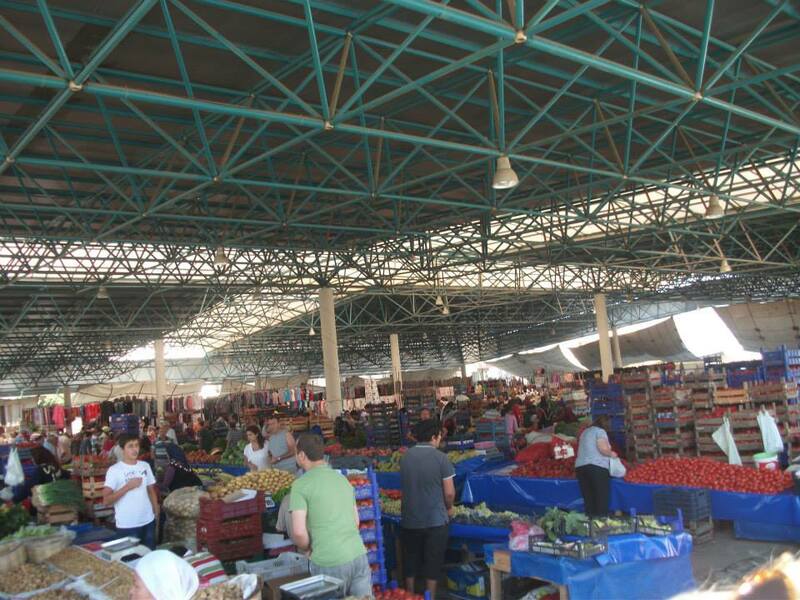 Whilst the market in Kusadasi is a place I find incredibly intimidating, the market in Davutlar is glorious. There's fresh food to the right, and every kind of knick knack you can imagine to the left - from clothes to door knobs and olive oil. They also sell the most incredible Turkish pancakes called Gozleme. Divine! 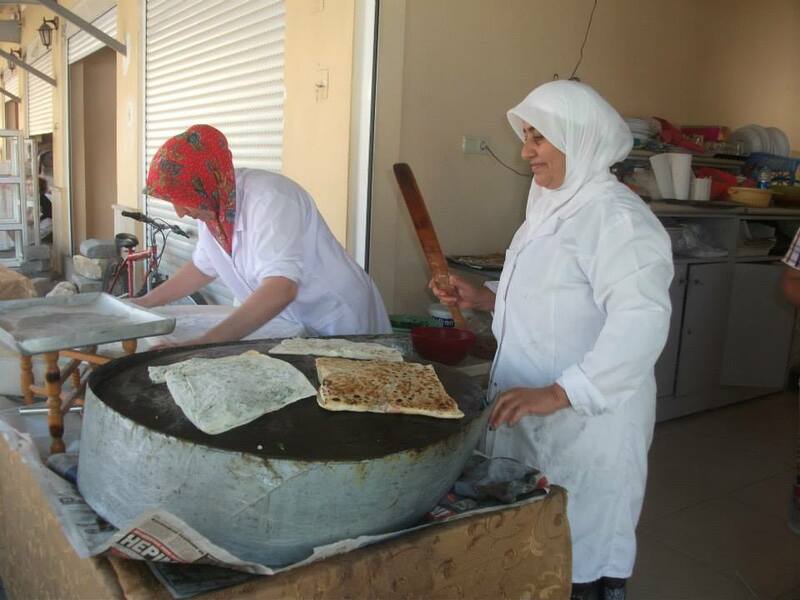 The food in Turkey is delicious, and one of my favourite things about visiting the country. We buy copious amounts of fresh fruit and vegetables from the local stall which is owned by a family who have set up under a tree near our villa! It's so cheap, delicious and good for you too. I love the meatballs and chicken shish that are so typically sold in Turkey. 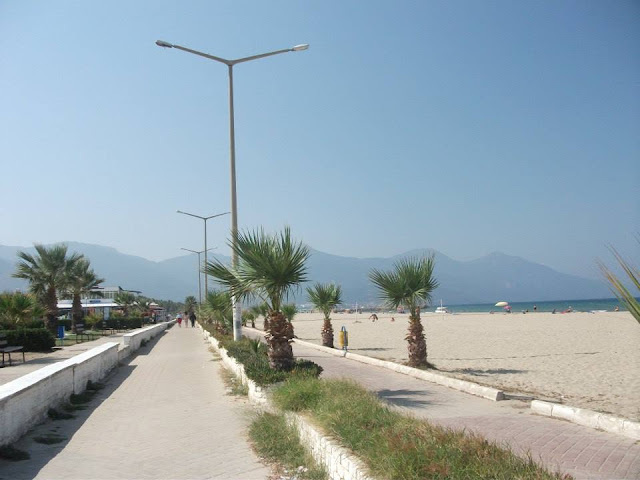 Stuning sandy beaches are one of Turkey's jewels. 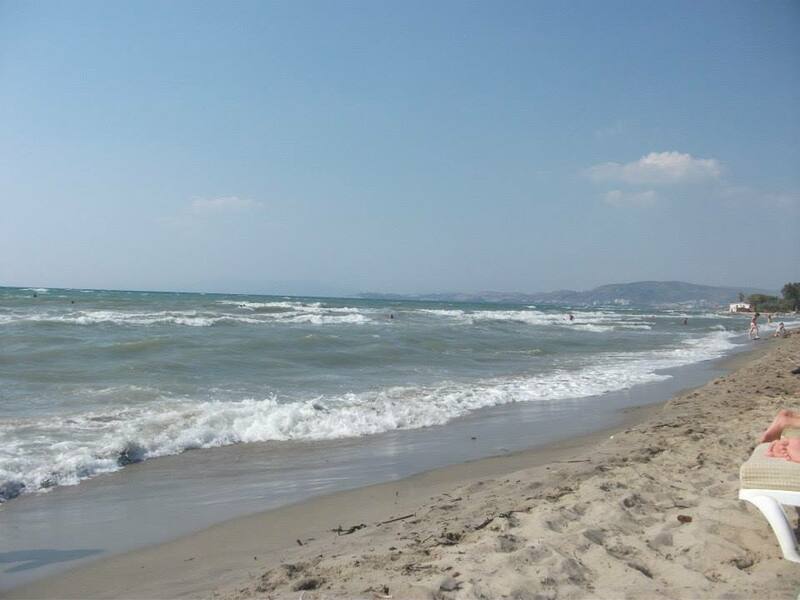 I'm not normally a huge fan of spending time on the beach itself, but in Turkey I'm always up for a trip to the beach. There's sunbeds, water sports if you fancy it and plenty of restuarants. The sunsets are always some of the most spectular I have ever seen, especially with the back drop of the mountains behind the sea! 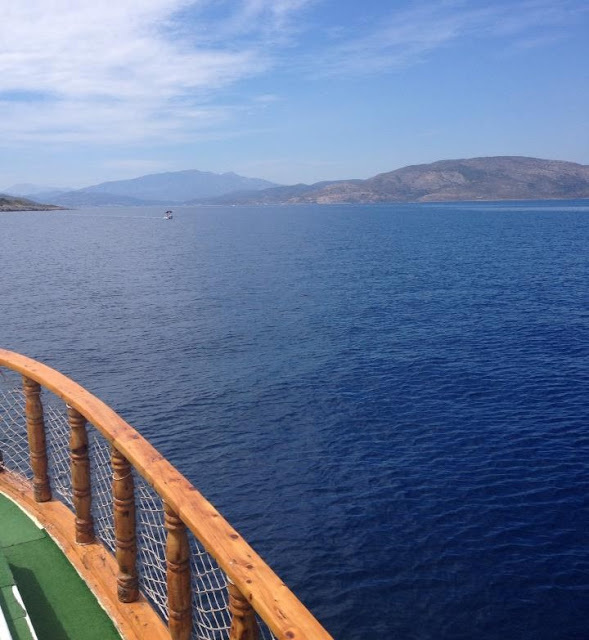 Whenever we're in Turkey we always head out to sea at least once on a boat trip. There are quite a few tours that go out - one of them has a foam party whilst the others are much quieter and we always pick the more relaxing trips! It's so peaceful to be out at sea and enjoying the sunshine whilst seeing some of the stunning scenery of the local national park. It truly is amazing, and I'd definitely recommend a boat trip if you are in Turkey. Where we stay in Turkey there is a gorgeous national park in the next village along from ours. 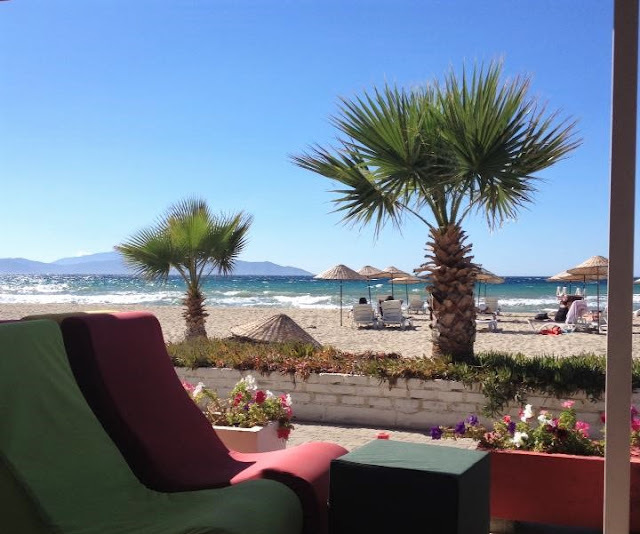 It's so nice to see all the mountains and you can even see the Greek island of Samos from the beach! Truly stunning and nice to have a mixture of different sceneries to explore. The Turkish language is so different to many of the languages I usually hear when I am travelling and exploring, but it is easily one of my favourites. I love the sound of it, and find it so interesting to listen to. Whilst I haven't learnt much Turkish, I do know a few phrases which is another thing I love about exploring a new place. We always tend to go to Turkey in late August, although one year we were there until mid-September and the sun was still blazing hot - around 30°C every day. Thankfully there is a bit of a sea-breeze due to being fairly close to the coast which is lovely when you are exploring the local towns and markets. I love the sunshine, and Turkey always delivers! 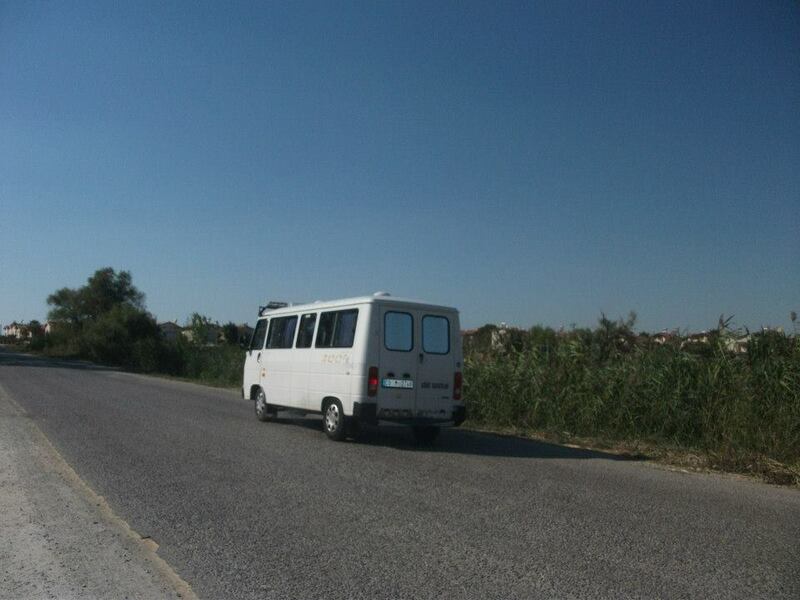 A Dolmus is effectively a mini-bus which is used as a public bus. 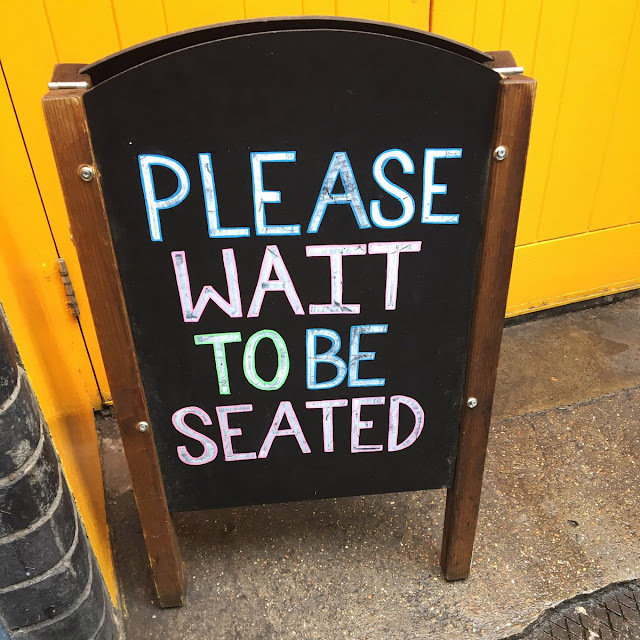 Whilst it may not sound that exciting, trust me - you are wrong. Travelling by Dolmus is inexpensive and great fun! Each driver tends to decorate his own Dolmus in his own unique way - so I've been in ones focused on Religious decoration, whilst others are full of football memorabilia - I love it! It adds a personal touch. I have seen some of the most amazing things in Turkey; normally when I am on the boat trip. It was the first time I ever saw Dolphins in the wild which was truly incredible. They were swimming under the boat, and alongside us - which was insanely cool. We also saw Turtles on our first trip which was pretty special. 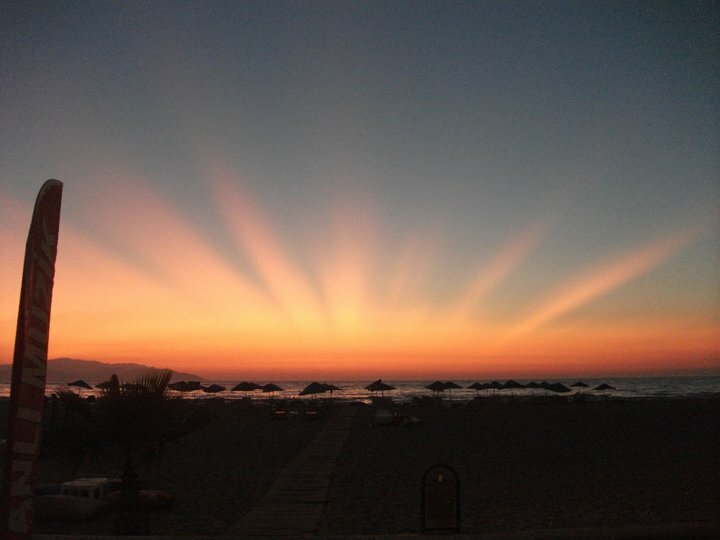 Turkey is a stunning country, and well worth a visit. I'm hoping to visit Istanbul as I'd love to see somewhere a bit more built up in Turkey rather than the coast. Maybe one day I'll learn a bit more of the language too, but for now you'll definitely find me in one of the markets!